This science experiment is adapted from the Salters Horners Advanced Physics Project. It corresponds to Activity 36 from the ‘Transport on the Track’ section of the course. In this two part activity a model railway wagon is allowed to run, out of control, down an inclined track and collide with an energy-absorbing buffer. Part 1 involves a competition to see who can construct the safest buffer to bring the wagon the rest. Part 2 allows you to use your knowledge of resistor-capacitor discharge and dynamics to calculate the velocity with which the wagon bounces back off the buffer. Ideally there should be no bouncing back, but that is difficult to achieve. The model wagon runs, from rest, down the inclined track. As it moves along it forms a circuit which allows a capacitor to discharge as indicated by a fall in the voltage across it. You will use this to time the wagon’s passage along the conductive section of the track, and hence estimate its final velocity, assuming uniform acceleration. Note that both the front and rear wheels and axles of the wagon are conducting across the track, so think carefully what distance of travel you need to measure. If it has not already been done for you, set up the apparatus as shown in Figures A36.1 and A36.2. Figure A36.1: side view of apparatus. Make up your impact-absorbing buffer by inserting your chosen material into the buffer box, choosing from those made available to you. Place this buffer box centrally up against the button of the force sensor - there are markers on the box to indicate the centres of each side. Position the force sensor and buffer box so that, when the wagon is fully on the lower non-conductive section of track, its bumper makes contact with the buffer. 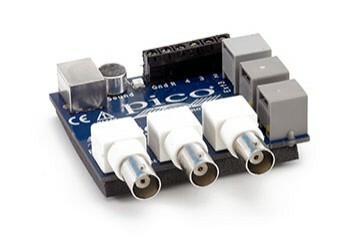 Connect the output sockets of the force sensor to the voltage input of Pico DrDAQ data logger or ADC-40/42 oscilloscope, load the PicoScope software, and plug a 9 V alkaline battery into its battery clips. Measure and record the distance that will be travelled by the wagon whilst the capacitor is discharging. Note that this is not the length of the uninsulated section of track. Measure and record the mass of the wagon, complete with any added load. Note the value RC (its Time Constant) of the resistor-capacitor combination on the RC Timer unit. Close switch S to ensure that the capacitor is fully charged to around 6 V, then open switch S. Check that the reading of the voltmeter remains near constant - it may decrease very slightly but that will not matter. Place the wagon on the top insulated section of track with its front wheels as close as possible to the uninsulated section. Note the voltmeter reading Vo. With DrDAQ select the oscilloscope display if it is not already on the screen. Select Volts, Y gain 10 for Input A. Leave the other inputs off. Set the Time base at 20 ms/div; the X gain to 1; the Trigger to Single, Volts, rising and +20 mV*; and the Display setting (right-hand box at the foot of the screen) to -10%. You can adjust both the X and Y gains afterwards if the trace does not display as you would wish. Click GO and let the wagon roll down the incline. With the ADC-40/42 select the oscilloscope display if it is not already on screen. Next set the Timebase at 20 ms/div; the X gain to 1; the Y-gain to 10; the Trigger to Single, rising and +20 mV*; and the Display setting (right-hand box at foot of screen) to -10%. You can adjust both the X and Y gains afterwards if the trace does not display as you would wish. Click GO and let the wagon roll down the incline. *You may find that you can lower this slightly but it must be set to a value which prevents it triggering too early. Reposition the force sensor so that it is facing vertically upwards. With select the Meter display and set it to Volts and DC Signal. Note the voltage output V no load with no load on the force sensor. Take an empty buffer box and fill it with sand until box and sand weigh 100 g. Balance the box of sand centrally on the button of the force sensor and note the voltage output V loaded . With the ADC-40/42 select the Meter display and set it to DC Volts. Note the voltage output V no load with no load on the force sensor. Take an empty buffer box and fill it with sand until box and sand weigh 100 g. Balance the box of sand centrally on the button of the force sensor and note the voltage output V loaded . Use this information to initially calculate the force which produces an output of 100 mV. See results and see teacher's notes section 1 if you need help with this.